I look through my new cookbooks that Santa brought, trying to come up with a menu for New Year's Eve as well as something for our annual 13-course dinner... nothing set yet, so I'll have to keep looking! Meanwhile, I let the crock-pot do some work. Start by browning the meat, bacon, garlic and mushrooms, and add to your crock-pot. Add leeks, shallots, carrots, the stock cube, porter and red wine. Let the pot cook for 8 hours on low. 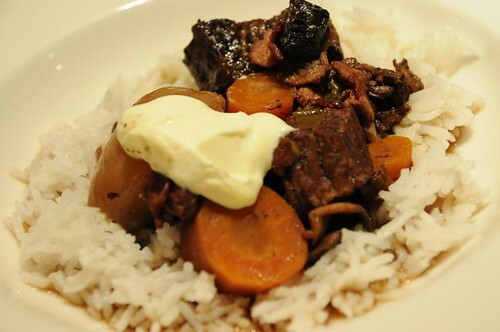 Serve with rice and a dollop of smetana or crème fraîche.